Jalandhar: Bollywood stars of upcoming Hindi movie Rangrezz, Jackky Bhagnani and Priya Anand, who played actress Sridevi‘s niece in famous film ‘English Vinglish’, captivated LPU’s mammoth student-audience at its campus today. 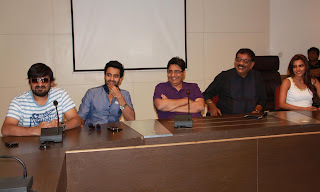 Movie’s versatile Director Priyadarshan and Producer Vashu Bhagnani were also with them. Also accompanying them was renowned Music Director & singer Wajid (of Sajid-Wajid duo and reality shows fame). Wajid sang a famous number of the movie "Govinda Aala Re" and forwarded important music tips to music worshipping students. Jackky and Priya also performed on the other hit numbers "Shambho Shiv Shambho", "Yaaron Aisa Hai" and a Rahat Fateh Ali Khan & Hirali Brahmbhatt melodious sung"Dil Ko Aaya Sukoon". During these bewitching performances thousands of national and international students kept singing and skipping along with them and learnt their dancing steps towards hop, ballet, Ras, Tap, Salsa. Seeing their live performances students heaved sighs and moans and applauded each and every action of their through claps and cries. Veteran film industry Director Priyadarshan and producer Vashu Bhagnani of the film interacted with LPU students of Journalism and Film Production and guided them about many movie making technical skills. They told students that Rangrezz is a Hindi remake of Tamil hit film Naadodigal, which has already been remade in Telugu, Malayalam and Kannada: “We are a good team and did several films together, and we are happy to be amid you all for a must watch movie- Rangrezz. We feel the film has shaped out to be simply outstanding, rest depends upon your viewing the film on March 21 and appreciations thereof." Jackky and Priya liked LPU Campus and students very much. They got mixed with the students and let them a part of enchanting performances. Jackie asked student believe upon yourself and do the things as you wish, whereas Priya told girls to know yourself and be what you want to be. Wajid conveyed that students should be true to themselves like the organic music. Vashu and Priydarshan also told students to learn from their lives and be bold to face it. LPU’s Pro Chancellor Ms Rashmi Mittal wished all the best to the visitors from Mumbai Film Industry for the success of Rangrezz and asked students to learn from the hard work of the visitors which has led them to be on the top. Watch Rangrezz movie online on M4ufree player. As a smart writing service professional analyst who writes for a living and has reviewed many reports written by colleagues over the years, I can confidently state that young Americans are not the only Americans who lack proficiency in writing. Bollywood movies are awesome! If you need some essays written, I offer my essay services for any related topic. This is great movie. You can download such movies from free download movie site and keep enjoying such free movies to watch movies online. Thanks for sharing details of every events at LPU through such high authority movies blog. Play online spider solitaire,this is simple game play and here the best original classic card game,now this is good time,and click this visit free online spider solitaire i love excellent graphic and nice background music,such a great beautiful awesome different game more then. It's clear for me that information from https://pro-academic-writers.com/blog/ethics-essay will be useful if you want to develop your writing skills. Here you can find out a lot about writing ethics essay.